CJFP is always looking for online articles and blog posts from UChicago undergraduates! To become a staff contributor, we require at least two full-length articles per academic year (or one per quarter). Any UChicago students who submit at least one full-length article per year or any number of blog posts can be listed as guest contributors. 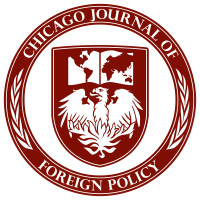 If you are an undergraduate from any college or university interested in writing about foreign policy and foreign affairs, and would like to submit an original long-form piece to be considered for seasonal print edition, feel free to contact us at chicagojournalfp@gmail.com with a proposal for your piece.